United States star Amanda Sobhy has risen 12 places to No.18 in the PSA Women’s March World Rankings to break back into the world’s top 20 for the first time since October 2017. A ruptured achilles sustained while match ball up in the semi-finals of the Ciudad de Floridablanca last March saw Sobhy face 10 months on the sidelines, with the former World No.6 dropping as low as No.30 last month. But the 24-year-old Harvard-graduate reached a semi-final at the Cleveland Classic and then a quarter-final at the Windy City Open in February to facilitate a return to the top 20. 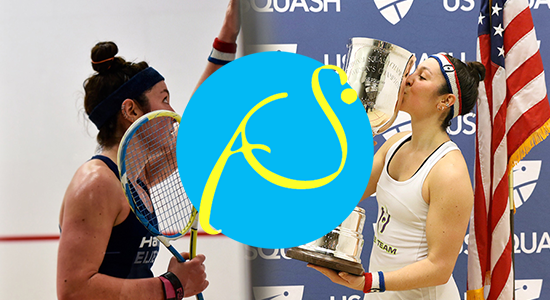 Elsewhere, the rankings are headed up by an Egyptian top three for a second successive month, with Nour El Sherbini, Raneem El Welily and last night’s Windy City Open champion Nour El Tayeb sitting ahead of England’s Laura Massaro and fellow Egyptian Nouran Gohar, the latter returning to the top five after spending last month outside it. A quarter-final exit in Chicago for Camille Serme sees her drop a place to No.6 – her lowest ranking since November 2016 – while Windy City Open runner-up Joelle King rises two places to No.7 – her highest ranking since October 2014. Malaysia’s eight-time World Champion Nicol David falls to No.8 – the first time she has dropped outside of the top seven since November 2004 – while England’s Sarah-Jane Perry drops a spot to No.9 to sit ahead of compatriot Alison Waters, who completes the top 10. Annie Au stays at No.11, while Tesni Evans and United States No.1 Olivia Blatchford retain their respective rankings of No.12 and No.13. Australia’s Donna Urquhart, England’s Victoria Lust and India’s Joshna Chinappa all move up a place to No.14, No.15 and No.16, respectively, as England’s Emily Whitlock falls three places to No.17. Sobhy comes next at No.18, while Hong Kong’s Joey Chan and India’s Dipika Pallikal Karthik round off the top 20.